All about the 11th President of the United States, James K. Polk. Greatly underestimated, many scholars rank him in the top 10 of greatest US presidents. 1. 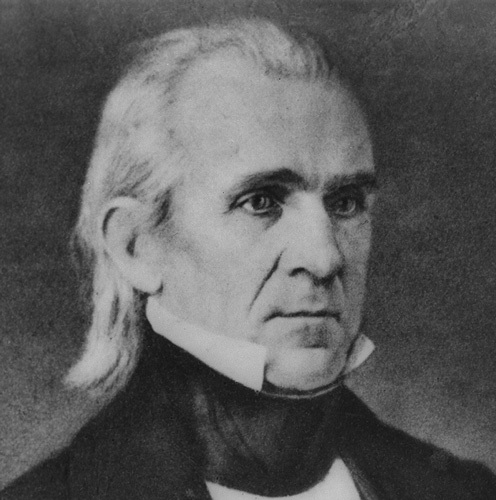 James K. Polk was born in Mecklenburg County, North Carolina, but mostly lived in and represented what state? 2. Which of the following early 18th century US politicians did Polk support? 3. James Polk was a lawyer. What was his first case? 4. What was Polk's first office as a public servant? 5. Who did Polk defeat in the 1844 election for President of the United States? 6. In 1848, Polk resolved a boundary dispute with Britian, establishing the United States as the sole owner of what territory? 7. In 1848, under the direction of President Polk, the US negotiated a peace treaty with Mexico to end the Mexican-American War. What was it called? 8. Which of the following states was NOT admitted to the union during Polk's administration? 9. One of Polk's last acts as President was to sign the bill creating what new United States federal executive department? 10. After his first term, Polk was the first president to do what?